“Your entire sense of self-worth is predicated upon your belief that you matter, that you matter to the universe. Imagine one day you are taken from your home, your backyard, or your favorite coffee shop, and you wake up disoriented and paralyzed in a sterile and dark environment surrounded by technology unfamiliar to your world. You are approached by giant slug-like creatures, lacking any human features—a scream freezes in your throat—is this real? You are presented with a red button. The slugs shows you clips of the planet Earth exploding, over and over again. If you press the red button, you can save the world. But if you don’t press the button, the world ends. So the question is: If you knew the world was ending, and you had the chance to stop it, would you? 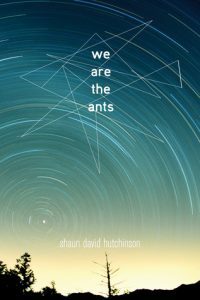 The protagonist in We Are the Ants, by Shaun David Hutchinson, is a nihilistic and caustic young man named Henry Denton, or Space Boy as he has been so lovingly nicknamed. Henry has been frequently abducted since he was thirteen by aliens he refers to as “sluggers” due to their slug-like appearance. During one of these abductions, the sluggers communicate to him that the planet Earth will be destroyed in exactly 144 days, and he has been chosen to either save the planet, or let the world as he knows it end. What seems like a straightforward decision turns out to be much more complicated as Henry’s judgment is entangled in the lives around him, as well as his own inner turmoil. The nerdy science teacher who desperately tries to protect Henry from bullying and encourages him to see a life beyond high school. The new boy at school, who immediately draws Henry to him with his charm but proves to be more mysterious and guarded than he presents himself. The older brother who drops out of college to provide for his pregnant girlfriend and his unborn child, who finds it difficult to connect with his younger brother. The mother who never followed her dreams and instead relies on alcohol and cigarettes to get her through the day, though not once does her faith in Henry waiver. And finally there is the grandmother, who is slowly losing parts of herself to Alzheimer’s, but still manages to make Henry a school lunch. These separate pieces written by any other author could come across as melodramatic or overdone, but somehow Hutchinson creates an entire group of three dimensional side characters, all equally important for Henry’s transformation throughout the novel, as well as influencing his ultimate decision. Emotionally, I connected with each and every one of them (even Henry’s deceased boyfriend, whose personality was revealed through flashbacks). I especially connected with Henry himself, who is complex, acerbic, and deeply, deeply fractured. It was easy to read this book so quickly with the accessible and poignant writing style, but I often found myself reading as much as I could because I needed to know that Henry would be okay. I needed to know what would happen next. We Are the Ants is heartbreaking, thought-provoking, and incredibly real. Henry’s actions are never contrived or dramatic—he is humorous, self-deprecating, and generally an impressive human being. This is a book that will stay with me for many days to come—a truly unique coming-of-age story.